Our newest feature allows you to embed a button on the page as a hover, callback, chat, appointment “Call to action”. You can then restyle this button by changing the elements of the code above to determine the color, shape, size, font size, hover effects, etc. You can also change the code to determine where on the page you want it to be placed. We chose the bottom right… as you can see with the “bottom:1%” label in the code. Here I will highlight the areas that you will want to edit to make your code perfect… Also, notice the second bold area at the end of the URL… We used this to go direct to an appointment type rather than going to our menu of differnent appoitment types. You can get this link by going to Settings, Appointment types and then clicking on the link icon next to the appointment type you want to send the customer to… and then copy and paste the URL into the code. One of the most popular requests we get is asking about building a custom button… we are working on ways to automate this…. but for now we want to share a few tricks. Step 1. Find the HTML embed code by going to Settings > Integrations. The button code shows on the bottom of the page… this code can be copied and pasted as an HTML element into any website (wordpress, square space, weebly, wix, etc) and used immediately. Step 2. Making the button look the way you want. Our default code shows a blue and white button. This button is referenced in the first line of code with the PNG file. You can replace this PNG file with your own button image URL, changing the size parameters too. You can create your own button at www.dabuttonfactory.com, click the embed button and it will give you a url. You can replace the url in bold below with your new URL. Step 3. Customize the code with HTML. This code below is the exact code to display our booking button. You can change the highlighted areas to match your own design and styling. You can change the bold areas below to make it your own! Step 4. Use the button to only show a specific category, staff member, appointment type, classes, etc. 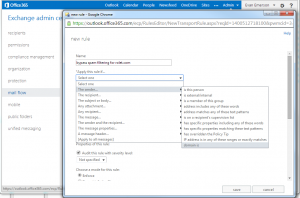 Replace the URL in the code to reflect the particular link you want displayed. If you are taking appointments in 2 languages, we recommend creating the appointment types in different languages as well… and then linking to that specific appointment type or the category of appointments, and the link will end with the language differentiator. Thats it, if you need any help please let us know! Bookafy now allows businesses to automatically inject data that you collect from your website, and insert it into our booking application. Maybe you have a couple of fields (Name, Email, Phone) or maybe you have a bunch of fields like Name, Business Name, Position, Website, Email, Phone, Address, City, State, Zip. When your customer fill out the information in the form on your page, you can pass on the content of those fields from the form. Most form builders allow this functionality… you will have to check with your specific form company on how you can pass the info in the URL when the customer clicks Send or Enter or maybe “book now”. Once the data from the forms is injected into the URL, you can pass that URL to our booking page through the link combination below. Booking Button – currently it says “Book an Appointment” but now you can change it to anything you want. Schedule Now, Book, Book Here, etc. If you upload your customer list into our system, once you start typing the customer name into the first field, the rest of the info will auto fill. This will save you a lot of time hand entering contact info. When it comes to importing customers, there are a few pointers we want to give you. I’ll show you in this video, or feel free to read below. 1. The reason you want to add your customers to the database is to increase efficiencies in creating appointments and to keep a central list that can be exported easily to mail chimp, constant contact and many others. 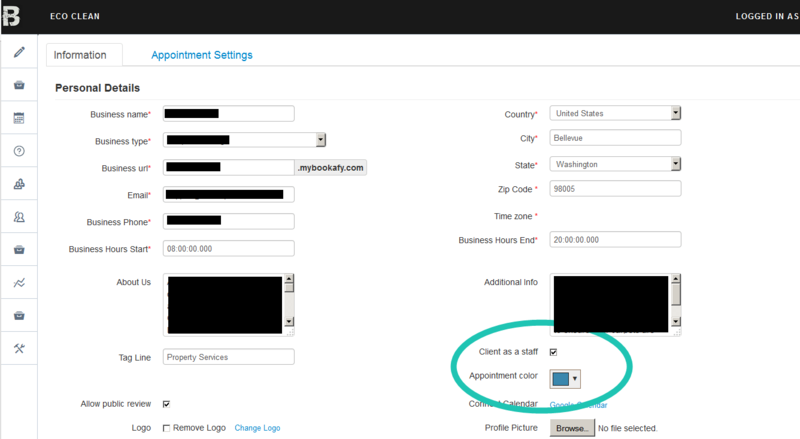 When you are creating a new appointment, if you start typing your customers name into the fields… the rest of their contact info will autofill. This makes it quick and reduces the possibility of errors. Now you can go to the menu on the left, click on Customers, click on Browse, find your file. Then Click import. If it is successful, your customers names will appear on the lines below immediately. dependent on technology, HIPAA compliance is an overall organizational obligation that focuses on your procedural standards and procedural integrity (medical provider business practices). Therefore, HIPAA compliance for software requires a combination of secure/private technology and compliant business practices. Bookafy provides clients with a software tool that is HIPAAcompliant from a technology standpoint as detailed below. However, Bookafy technology is only half of the inquiry – how client users use Bookafy software within their medical practices must also be addressed. Bookafy technology, security, and privacy policies comply with HIPAA standards, such as encryption (SSL), system-user identifiers (logins, passwords), multiple user access levels, high-end physical server security, nightly backups, strong privacy policies (not sharing information with anyone unless you direct us to), timed log out, strong internal policies (having employees sign strong privacy agreements), and much more. These are detailed on our website (www.Bookafy.com) in the FAQ section and the Privacy section. Additional security and privacy safeguards can be enabled at the option of clients, such as user IP restrictions and forced interval password changes. In regard to business practices, Bookafy provides clients literally of preferences in defining how they want to set up and use the system in their day-to-day medical practices. This includes preferences concerning of user access types, how backup files are run (through Excel Reports), when clients run their own offsite backups, how clients require users to login to the system – and many more business practice questions. All of these options and more potentially impact the business practices inquiry and the related obligations under HIPAA. Each “Covered Entity” must make its own determination of the system use and its overall impact on business practices. Please feel free to call us if you have specific questions as to the interplay between our software and your business practices. If you already have a web site, you would simply add an iframe or button to your site with the html code provided in Settings > Integrations > Step 4 or Iframe. Can I call if I have questions about the appointment scheduling software? Yes. We offer 24/7 phone and email support. Our office phone number is (800) 849-9934. We can help you set up your account from start to finish with no time restrictions! For ongoing custom data exporting, we have an Open API that we can give our customers full access to. 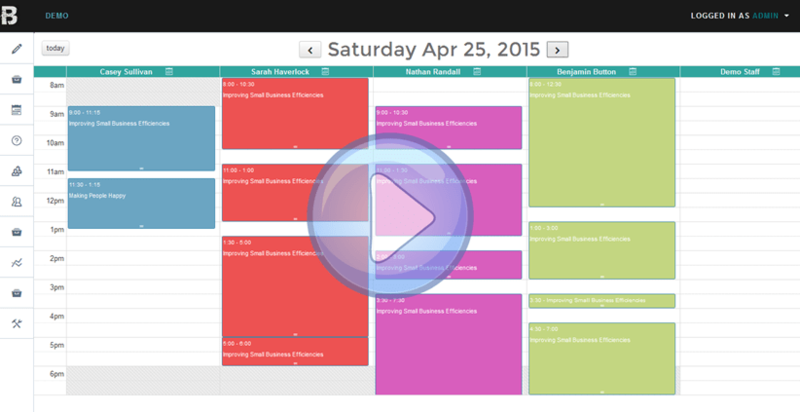 Are there any limitations in the trial version of your appointment scheduling software? No. During the trial period, you will have access to the entire appointment scheduling software system. If you decide to continue using the system after your 30 day trial period has ended, you will just continue using the same account. You can upgrade anytime by click Upgrade on the header. To create a recurring appointment, click on the calendar to add an appointment… then towards the bottom of the screen click on “Recurring”. There you can set up all of the attributes of the recurring appointment. First, it is not necessary to sync with mail chimp. It is optional, and only for your benefit. If you do sync with mail chimp, or not… the rest of the software works exactly the same. Step 1. On the top right, click icon, then settings, then Integrations on the left. 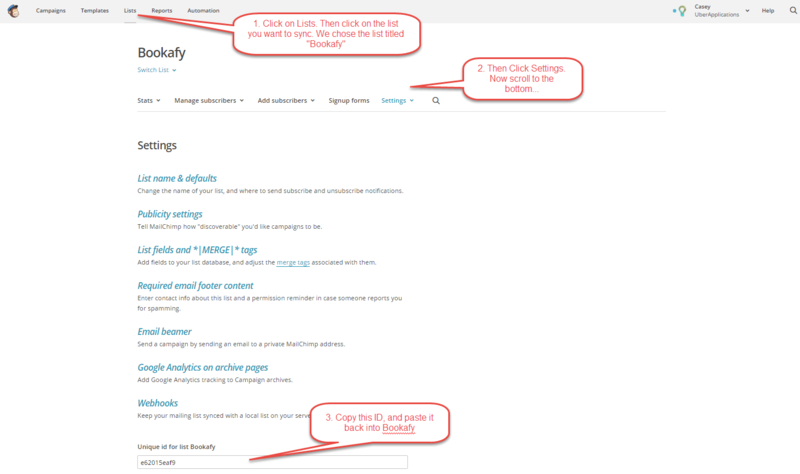 Then click on MailChimp in top middle and the screen below will appear. Step 2. 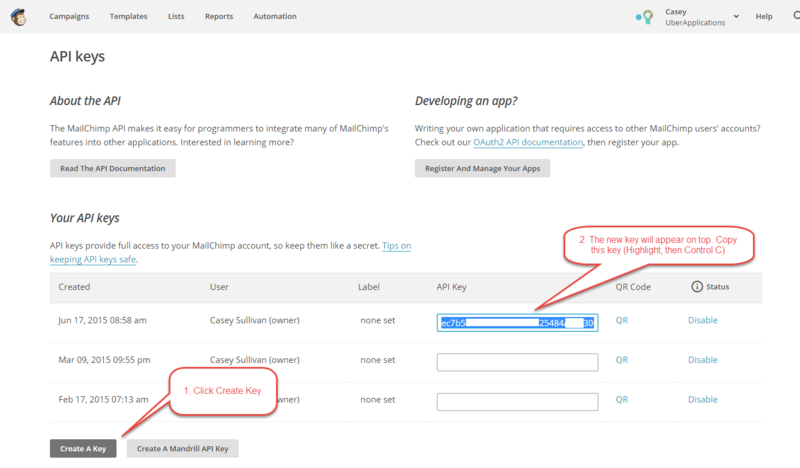 Click Connect, then you will see this screen where you will enter your mailchimp API key and the ID of the list you want to add people to. Step 3. Then go to Mailchimp, click on your profile on top right, then account. Step 4. Click on Extras. Then API Keys. Step 5. Then click on “Create a Key”. Once created, copy this code and then go back to Bookafy. Step 6. Pasted API Key into Bookafy that you copied on last step. Next, you will need to go back to Mailchimp. Click on Profile, then dashboard. Step 8. Once in the dashboard, click on Lists. Then click on the list you want to add Bookafy customers to. Then click on List Name and Defaults. There you will see a list ID on the right side. Copy that code to paste in Bookafy. Go back to Bookafy page. Step 9. Paste the list ID into Bookafy. Step 10. Then click Connect. Everytime you get a new appointment, we will automatically send the customers name and email to Mailchimp. This will keep your email list updated and ready to market to! Once you set up your account, all of your customers will automatically get a SMS Text reminder 24 hours in advance of the appointment. If you wish, you can change the time the reminders go out, but we recommend either 1 or 24 hours for most all businesses. That are the times that we have seen the most success. When you are creating an appointment, it is important that you are entering a cell phone number in the phone number field. That is the number that the SMS is delivered to. As well as SMS Reminders, we send out a Email reminder (Same time as SMS Reminder) and an email confirmation a the time the appointment was created. 1. Appointment is created and an email goes to the customer. The email includes information about the appointment, as well as a calendar attachment. Your customer can click on the attachment and save the appointment into their personal calendar. 2. At set reminder time (default 24 hours) we send SMS text message and Email with appointment details and text reminding them of their appointment. 3. After the appointment, we send the customer a request for a review. You can turn these notifications off if you choose. And you can elect to have the reviews display on your page or not. Your choice. Staff and Appointment Types are highly customizable. It is likely, if you have a business with more than 1 person, that everyone doesn’t do the same types of appointments. There are a few ways to assign appointments to staff members. 1. You can edit the appointments for each staff by editing the staff. Click on Settings, > Users > Edit next to the User name. Then click on the tab inside of the edit screen called Appointment Types. That’s it! 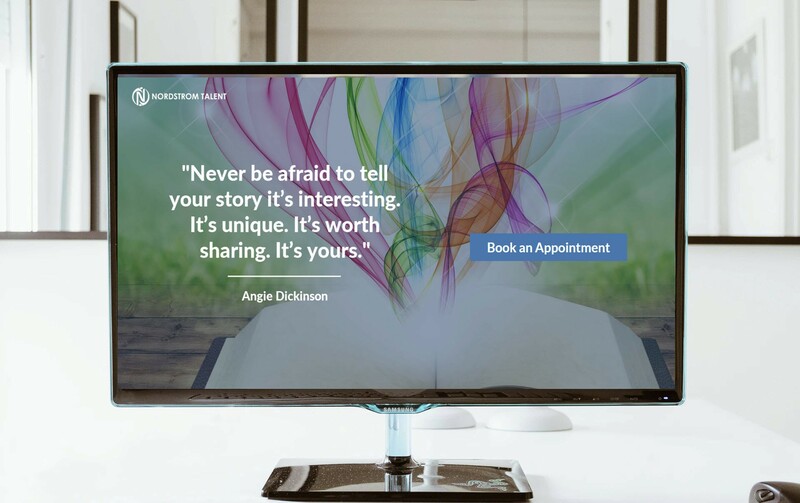 Totally customize what your customers see when they are booking, to prevent your staff being booked for the wrong types of appointments. The google calendar 2-way sync is a great tool for staff and admins alike. As you may know, most staff members have a personal calendar and the challenge is keeping the work calendar and personal calendar straight. With the Google (and soon Outlook) 2-way sync, all of your appointments on Bookafy will sync to Google, and all of your appointments on google will block the time in Bookafy. 1. If you are Admin, go to Settings, Integrations, Calendar and click on Google 2-way Sync. Follow the steps as prompted. It typically takes a few minutes to sync the calendars. 2. If you are a staff/user, click on settings, then scroll down and click on connect to google Calendar. Once connected, choose which Google Calendar to Sync. A good way to drive more appointments to your calendar is adding a link to your booking page to your email signature. If you use gmail, you can add this in just a minute or so… watch the video below to see how! Third-party apps using iCloud will be required to use app-specific passwords. Here’s how to generate one. As of June 15, Apple will require all third-party apps that use iCloud to store data to use app-specific passwords for added protection. App-specific passwords ensure that your Apple ID isn’t compromised if you need to add your iCloud account to a third-party email, calendar, or contact manager app. It creates a password that those third-party apps will store instead. It is just another layer of protection that will ensure you’re protected from nefarious activities. You’ll need to have two-factor authentication enabled in order to generate app-specific passwords. Two-factor authentication is different than two-step verification. Note:Whenever you change your Apple ID, all of your app-specific passwords will automatically be revoked and you’ll have to generate new app-specific passwords for each app again. Navigate to Appleid.apple.com from your web browser and sign in with your Apple ID and Password. Under the Security section, select Generate Passwords.If you don’t see the option to generate app-specific passwords, you’ll need to enable two-factor authentication, which is different than two-step verification. Launch the app for which you need the app-specific password. Paste the app-specific password into the password field that is asking for your iCloud password. From now on, the app you just generated the app-specific password for will use this specific password in order to access iCloud. If you every have to re-enter your iCloud password, use this app-specific password again. Mailflow enables you to set rules on the server before the email is delivered to Outlook. This is similar to setting rules using Outlook’s built in rules. 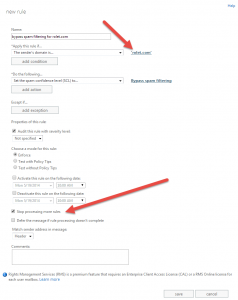 New rule details in Office 365. Click to view larger. Under specify domain, be sure to click the + to add the domain to the list. You can come back to this rule and add domain names for each domain you want to whitelist. There is no need to create additional global rules in Mailflow for each domain. You will now see your new rule in the list. To turn on spam filtering for all domains, uncheck the box under “ON” in the rules list. To turn the rule back on, simply check the box. Thank you for considering Bookafy as your online scheduling software. There are a couple of things we want to tell you about account set up. Watch this 15 minute video for a full tutorial on how to get started with Bookafy! Trial – Number of staff and services? Thank you for considering a Trial Account. The account is 100% free, and you do not have to give us any billing info whatsoever. At the end of the trial period, if you love the software then you can start paying based on the plan that is right for you. However, if at anytime you decide its not right for you (we hope this doesnt happen) then you dont have to do anything. You will never be charged, you wont have an IOU, you dont even have to cancel your account. At the end of your trial, we will just ask you for payment when you log on in order for you to use all of the functions of the site. The bottom line is this, we love the software, we have seen businesses transform with our software and we are fully confident that we can help your business so we are giving it away for free for you to fully test. One more thing… the trial is fully functional. All of the tools and resources in the paid version are available in the trial version. You can sync with outlook, sign up for payment processing, add 1 staff member or 100, add 1 service or 100. It is fully functional. Have fun and we are here if you need any help with set up. 1. If you are the admin and want to sync your personal calendar, go to Settings > Integrations > Calendar and click on Ical/Icloud Icon and follow steps. 2. If you are a staff/user, go to Settings, scroll down and click on Ical Connect. That’s it. It works great… Will keep all of your appointments synced up to your Ical calendar, with easy access on any device. Microsoft Outlook can sync 2-Way with Bookafy. With 1-Click, all of your Outlook appointments will sync to Bookafy, and all of your Bookafy appointments will sync with Outlook. The sync happens in real time, any new appointment, edited appointment or deleted appointment will automatically update in both systems. This avoids double entry and double booking. Each User can sync with Outlook.com, Office365 or a Private Exchange Server. To set up, go to Settings > Integrations > Caledar and follow instructions. Each user will also have to set up their own 2-way sync by logging in with the user’s email login, going to Settings and following instructions. For enterprise accounts, we can authenticate an entire organization with our dev team and the enterprise engineers. Iframe or Booking Button Integration for your Website? There are three primary ways to show your calendar to your customers. You can send a link from your website/email/facebook to our Booking Page. For instance, here is a link to the booking page for our demo account. https://demo.bookafy.com/ To integrate in this way, you just need to add a link to https://yourcompany.bookafy.com/ and it works great. You can even use this as your primary website. For instance, you can buy a domain (www.yourcompany.com) and forward it to the Bookafy booking page https://yourcompany.bookafy.com/. It works like a charm! Each User/Staff member will have their own booking page URL that can be customized with their photo. You can insert Iframe code into the site like we did on this demo page: http://bookafy.com/demo-iframe-page/. This is a popular integration and the customer never has to leave your website! The Iframe code can be found in Settings > Integrations > Iframe. Simply cut and paste into your site. If you need any help, please let us know! This happens from time to time, the services haven’t been assigned to the staff members, or the staff haven’t been assigned to services. If you are not able to see available staff on the service you selected on Iframe or Booking Page, the best thing to do is check to see if the staff has been assigned to services properly. The quickest way to check, Click on Staff on menu, then click the edit icon, then make sure all of the services are properly assigned. Then click save. Do this for each staff member and you should be all set! If you are looking to add or edit your staff members, we have created a quick video for you to watch. If you dont want to watch the video, there are further instructions below. Thank you! First, on the left menu… Click on “Staff Members”. If you are the company “Admin” and taking appointments… therehttps://www.google.com/search?q=1st+corinthians+13&ie=utf-8&oe=utf-8 is an extra step. This means, if for instance you own the Spa, manage the calendar, and you take appointments for services yourself… then follow this first step. Go back to Edit Profile. On the Bottom right, click “Client as Staff”. Once you click this, you will now be “Admin” and a “Staff” member that can accept appointments. This is very common for small businesses with owner operators. Over 75% of our customers are “Admin” and “Staff”. They own the business, and they manage staff, and they are staff. Now, go back to “Staff Members” on the menu. Enter the staff information. Name, email, their password and what services they will handle. Regarding “Role of Staff”/ There are two options. The staff can be just a staff member. With a Manager, they can have other staff schedules that they can see. You can assign other staff members under them, so the Manager can see their own schedule and the staff under them schedule. As admin, of course you see all schedules. Go through and create each staff member. You can create as many as you want. Its unlimited. Next, once all of the staff members are created… you will need to edit their profile. On the right side of the screen, under “Action” you will see a pencil. Click the pencil and this will allow you to edit. In the edit screen, update all of their info. Address, phone (cell is best), appointment color that will show on the calender, and add their profile picture. To add an image of that staff member. Here is a trick, if you don’t have company photos available… go to the staff members Facebook profile… find the picture you like the best (that best represents your company), then right click the image, save it to your desktop, then add it here as their staff image. If you don’t have great photos available immediately, don’t wait to get them and leave this area blank. This is the first thing customers will see when scheduling, so use this work around to fill the space with a “good-for-now” photo. 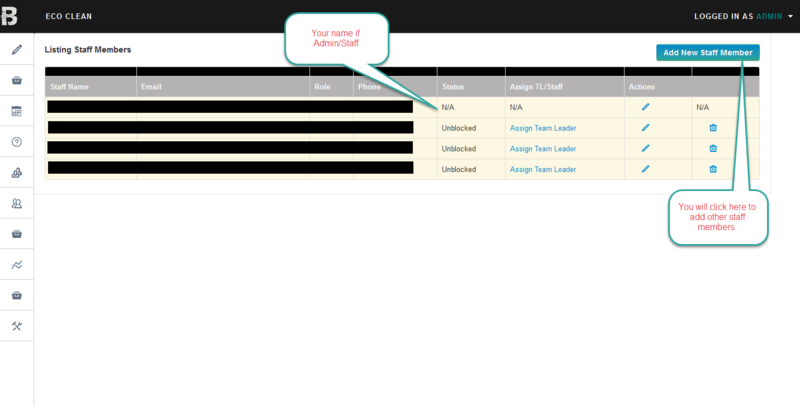 Each staff member can have their own set availability. One staff can be available from 9-5, another from 10-2, another 7-7. It is totally customizable and the customers will only be able to book the staff during the staff members available times. Done! Call, email, chat with questions. We are here for you! When your account is created, you will be given a subdomain URL such as https://demo.bookafy.com/. You can use this URL as your own website, or you can forward your URL to the booking page URL. The booking page is editable and has information about your business, hours, and ofcourse the ability to book online. Can I accept payments through Bookafy? Yes, you can process credit cards through the POS (point of sale) interface in the administrative view of the system. You can accept payments through Stripe or Authorize.net integrations. Go to Settings > Integrations > Payments and connect your payment gateway. Bookafy’s support team is available to help you set up your account from start to finish. We can help set up new staff, set up services and even help integrate the software into your existing website. Most of Bookafy’s settings can be found in the Edit Profile tab. There you can edit contact info, set your subdomain address, get code to iframe, set business hours and much much more! And… it’s all free! Contact us anytime and we will be ready to help! Your staff can all have their own customized schedules… You can set hours for each staff member individually, regardless of how many staff members you have. Scheduling staff has never been easier!